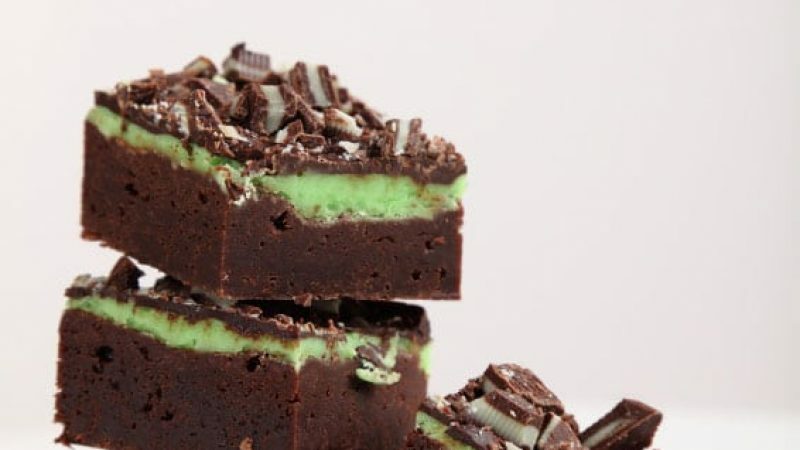 These Creme De Menthe Brownies are our holiday masterpiece! They are a decadent combination of mint and our Rodelle Vanilla and Cocoa. Preheat oven to 350°F. Line 9x9-inch square pan with aluminum foil and lightly grease. In a small, heatproof bowl, melt butter and chocolate together. Stir with a fork until very smooth. Set aside to cool. In a stand mixer fitted with whisk attachment, whisk together sugar, eggs, and Rodelle Vanilla Extract. With mixer on low speed, blend in the chocolate mixture. Stir until smooth. Sift flour, Rodelle Gourmet Baking Cocoa, and salt into a small bowl, then whisk into the chocolate mixture until just combined. In a small bowl, beat the cream cheese and ¼ cup sugar until smooth. Add 1 egg, mint extract and food color. Mix well. Carefully spoon filling over brownie mixture. Lightly swirl filling into brownie mixture using a chop stick. Bake for 45 – 50 minutes, or until set. Remove from oven and let set for a minute or so. Sprinkle chopped mints on the warm brownies. Let cool for about 5 more minutes, remove from pan, remove the foil and cool thoroughly on wire rack.